Aww I love designing anything for babies, these thumb less baby scratch mitts are so cute, warm and cozy, easy to pull on and with a tie ribbon bow they will stay on. Designed to fit a 3 to 6 month baby, they are quick to crochet and make a lovely gift for baby showers etc. Round 4 – ch1, 1sc in base of ch1, 1sc in each sc to end, sl st to first sc on beginning of round. Turn. Rpt Round 4 until 8 rounds have been worked from the beginning. Fasten off. Join in color 2, rpt Round 4 until 13 rounds have been worked from beginning. Turn. Rounds 16 & 17 – Rpt Round 4. Round 18 – (picot row) ch1, * (1sc, ch3, 1sc) in next sc, skip 1sc, * rpt from * to * to end, sl st to first sc. Fasten off. Finishing – Weave in and trim off any loose ends of yarn, thread the ribbon through the eyelet holes on wrist and tie in a bow, I have decorated with a ribbon rosebud, but this optional. I hope you enjoy making these baby scratch mitts. Get matching crisscross bonnet to make a set here. Speak to you next time guys. The written instruction and pictures for this free scratch mitts pattern are copyrighted to crochet ‘n’ create 2017. 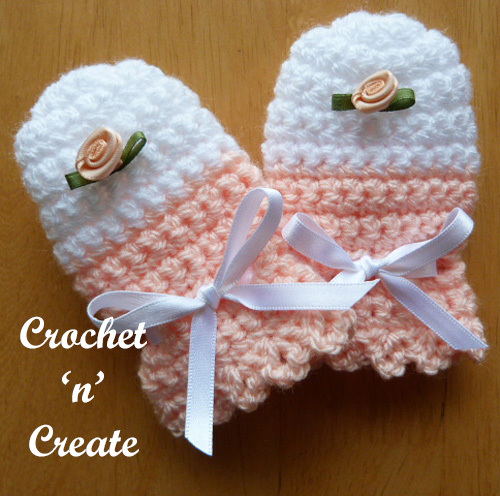 You are welcome to sell the finished products made from this free baby scratch mitts crochet pattern, I just ask that you please put a link back to crochet ‘n’ create. link to the pattern page on crochet ‘n’ create. 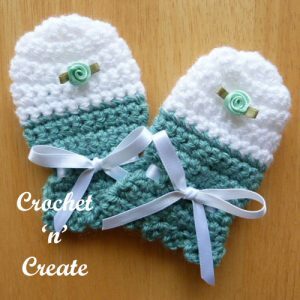 This entry was posted in Baby crochet pattern, free crochet patterns and tagged baby crochet, baby crochet mitts, crochet, free baby crochet pattern on 9th March 2017 by crochetncreate. Seems like a baby that age would put mitts in mouth and could choke on flower decorations by sucking on them. I love the pattern, I just leave off flower. Yes Kimberley, the flower was only put on for decoration and photographic purposes. It’s up to the individual to adorn as they wish. All my rosebuds, flowers etc are always optional. Thank you very much for sharing your patterns. I’m only back doing crochet after about a 50 year absence. Started very young but rem the basic stitches. But never had the UK v US experience so I love it when pattern makers either identify which is which or give the option to choose one version. Your welcome Imelda, hope you enjoy crocheting them.